Borrowing this quote from Rudyard Kipling and using it in the context of the e-commerce ecosystem, it is an accurate depiction of the mindset of retailers a few years back when eCommerce/e-Tailing had just started evolving. The times have changed and so have customers. One of the most O2O focused retailers, Nordstrom, now gets 20% of its sales from online channels, up from 8% just five years ago. Further, a survey by EY and Consumer Goods Forum Supply Chain Committee showed that over 88% of senior executives say they cannot rely on traditional sales channels to drive growth. If that were not enough, as per a survey conducted by Forrester Research and Internet Retailer, nearly 62% of shoppers want to buy online and return in store and well over 40% want the flexibility to buy online and pickup from store. Retailers are actively partnering with e-tailers and marketplaces to ensure a wider reach and to move slow-moving items online. This partnership also allows them to earn more revenues and to enable store pickups. With the customers being Omnipresent (with reference to channels), the lines are blurring (or already have) between online & offline worlds. As things get more and more competitive, retailers can and should leverage all the advantages that they have, while fulfilling consumer demands in the most economical way possible. So what does O2O comprise? 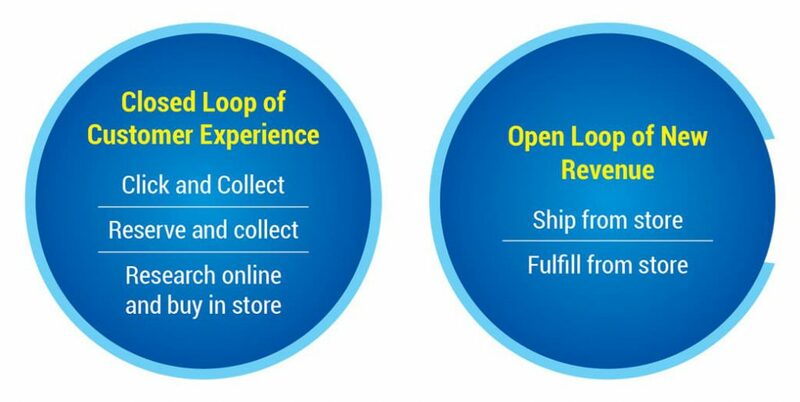 It’s all about a “Closed Loop” of customer’s experience; offering a fantastic, seamless shopping experience to the customers, ensuring loyalty, and most importantly, closing the sale. Additionally, it brings tremendous new opportunities to partner with marketplaces, eTailers & to identify new revenue streams. Are you a retailer looking to build customer loyalty and enhance their shopping experience? The closed loop enables you to orchestrate an experience for your customer that is a seamless mesh of your offline and online presence. Fulfillment options such as click and collect, reserve and collect, and research online buy in the store, can help you deepen ties with customers. Of these, click and collect has been talked of most often. Click and collect is a shopping facility provided by retailers, using which customers can order goods online from the store’s website and collect them from a local branch. Every retailer worth his salt from Nordstrom, Walmart, Best Buy to Macy’s is offering the click and collect service. Retailers that have better O2O offerings have consistently ranked higher for customer experience. The 18th Annual Mystery Shopping Study conducted by the etailing group ranks retailers on the basis of the Customer Experience Index. The results for 2015 show O2O-friendly Nordstrom, Macy’s, and The Home Depot, reigning at the top. Be able to look up inventory – see if the exact shoe is available at the pickup location. On finding the shoe, he should be able to pay online for it. When he has purchased, he should be able to pick up the shoe at a location of his choice. And lastly, when he reaches the selected location, the order should be ready for pickup. This is easier said than done. While the concept of click and collect brings together the world of online and in-store and is clearly popular with the retailers looking to draw in customers, it brings its own set of challenges. 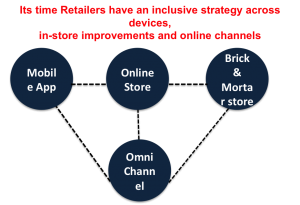 Lack of multichannel service and support: The store staff must be properly equipped to deal with the fulfillment of these orders. For instance, if a customer’s order is not present in the store, the staff must have the ability to check stores close by for the products. Equipping them with mobile POS solutions, and inventory visibility can make them better prepared. Lack of integration between systems: Convergence of CRM, supply chain and commerce processes is key. This brings together a single view of information – customer data, pricing, inventory, and supply chain. It helps retailers discern customer preferences, and accordingly, identify product availability. Kohl’s for instance, was one of the few retailers whose sales went into a slump post the recession. The retail giant completely turned around its operations by a series of smart strategic moves – one of which was investing in technology to bring an enhanced shopping experience to its customers. Our software products allow you to offer an unbridled closed loop of experience to your customers. Find out more – Ask for a demo today. Keep watching this space for the next in this series. 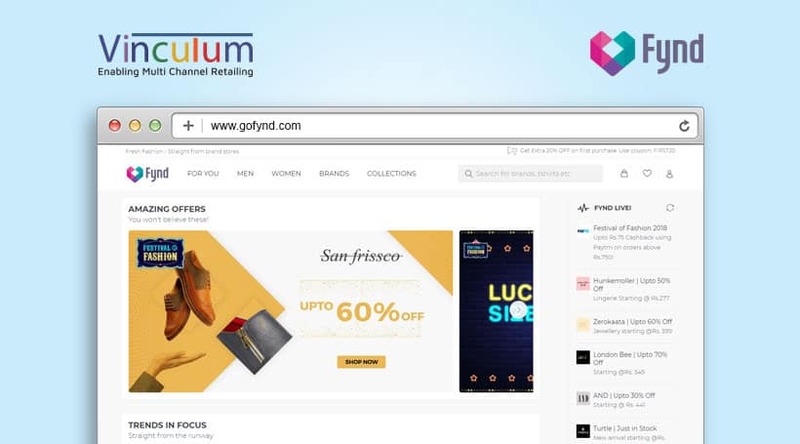 Vinculum Group, a global software company that enables the e-commerce ecosystem with SaaS-based products, has announced a strategi..